Every month Miss Newton sets an Art Challenge which is open to every child in the school. At the end of the month a winner is chosen, who receives a certificate and prize. Thank you for all of your entries to the March art challenge. It was far too hard to choose just one winner this month, and so there are two! These boys in Year 3 really stood out for their originality and superb presentation. Well done! Thank you for all of your entries to the January art challenge. It was lovely to see so many of you thinking about what it means to be a global citizen! 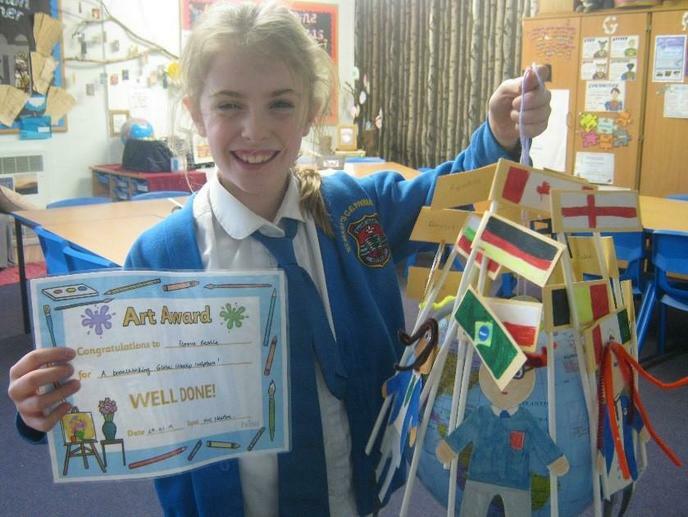 The winner of the January Art Challenge was a girl in Year 4 with her breathtaking sculpture representing different nationalities. Wow! The winner of the November Art Challenge was a girl in Year 4 with her still life inspired by Van Gogh. We can really see the influence of the artist in this picture, in the use of brush strokes and colour. Well done!